The Clifton Corridor Transit Initiative, a four-mile light rail line, would provide commuting options, decrease traffic congestion and improve sustainability in the Emory area. 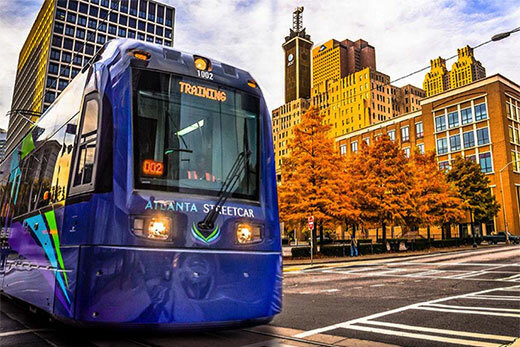 Light rail vehicles would be similar to the Atlanta Streetcar. Photo courtesy of MARTA. That traffic gridlock that can turn your Clifton Road commute into a frustrating slog? Atlanta Regional Commission planners saw it coming almost 60 years ago, when they recommended a rail connection to Emory University in their 1961 regional transit plan map — long before the Clifton Corridor would emerge as the region’s second-largest employment center and the thriving economic powerhouse that it is today. And for years, Emory and neighboring organizations have partnered to advocate for transit options to help mitigate the problem. Now, the campus community and its neighbors may be in the best position yet to see movement on a proposal to bring MARTA light rail service to the Clifton Corridor. Instead of driving your car through traffic, imagine instead using that time to read, study, catch up on email or simply relax as you wait for your stop on the light rail line. The project would help ease traffic congestion and provide transit access for thousands of workers who cannot easily reach Emory, the Centers for Disease Control and Prevention, Children’s Healthcare of Atlanta and the VA, while also making it easier for Emory students and faculty to travel to Atlanta communities for research, service projects and internships. When Atlanta voters overwhelmingly approved a half-penny sales tax in 2016, projected to raise $2.5 billion over 40 years, the money was intended to help fund the expansion and enhancement of the MARTA transit system, including the Clifton Corridor line — in total, the city’s biggest transit investment in decades. In May, MARTA released a list of project proposals for how to best spend that revenue, including a $503.6 million allocation to help construct a four-mile light rail line connecting MARTA’s Lindbergh Station to the Clifton Corridor that would serve Emory and its neighbors. Along with helping students reach campus, that investment would go far in providing job connectivity for Emory’s university and health care employees and those who work along the Clifton Corridor, says Betty Willis, Emory government and community affairs senior associate vice president and president of the Clifton Corridor Transportation Management Association (CCTMA). The CCTMA estimates the corridor is home to over 40,000 employees, with nearly 50,000 cars passing through the area each day. “We are the largest job employment center in the Metro Atlanta region that doesn’t have direct access to MARTA rail service or an interstate,” Willis says. “Many workers have long and frustrating commutes to get to their jobs in the corridor or to get to jobs in other parts of the metro region from the Clifton Corridor. In late August, the Emory community was encouraged to take an online survey seeking input on the proposed MARTA projects, which includes the Clifton Corridor Transit Initiative. The Clifton Corridor project received strong support in the survey, which ended Aug. 31. On Oct. 4, MARTA will vote on final project funding. Willis thanks everyone who took the time to answer the survey, and encourages the Emory community to continue advocating for the Clifton Corridor by sending letters and emails to members of the MARTA Board of Directors and the Atlanta City Council. For students like Haley Williams, simply getting to campus each day is a considerable feat. A new light rail line serving the Emory campus would be more than a convenience — it would offer a critical, time-saving option that would affect her every day. Williams, a junior studying psychology and theater studies, doesn’t have a car and doesn’t live on campus. To reach Emory, she must rise early and walk 20 minutes from her Duluth apartment to reach the Gwinnet County Transit bus line, which takes her to the Doraville MARTA station. From there, she rides to the Lindbergh MARTA station, where she catches a final bus that brings her to Emory. For Kevin Wright, who is a food service employee at Emory University Hospital, the proposed rail line would go far towards helping him make it to work. “I live on the west side of Atlanta and have to make it to the east side in the mornings,” says Wright, who takes a bus, a train and another bus ride to work each day. Beyond helping people reach campus, the line will also provide an easier way for Emory students — and neighboring residents — to explore the city. That would be useful to people like David Clark, associate vice president of Campus Life, who lives close enough to campus that he walks to work every day. In fact, Clark jokes that in the winter, “you can see the North Decatur Road building from my yard,” he says. His daily commute consists of a nine-minute walk; driving actually takes almost twice as long. In addition to streamlining commutes, the proposed line could also help improve regional air quality by reducing the number of daily drivers on the road, along with automotive emissions. “The proposed MARTA line to Emory is the single most important next step to furthering sustainability at Emory and in our community,” says Ciannat Howett, Emory director of sustainability initiatives. James Roland, senior director of Emory’s Office of Civic and Community Engagement, says he’s already working with groups and individuals across campus who are interested in making their voices heard on the project. “The Clifton Corridor is very important to me and transit connectivity to MARTA would have significant benefits to the Atlanta region. The Clifton transit line will be competing with other cities across the country for limited federal funding and is a strong contender for Atlanta to realize a $1B MARTA expansion — the largest in two decades."